Life without children could still be a nice life, but you have to figure out how to deal with leftovers! I tried many different things, some good, some horrible. You don’t even know–some were worse than the leftover itself. This time I think I’ve scored, though. I had larb and sticky rice left over, so I wrapped the sticky rice around the larb, a little tricky but doable, then deep fried the whole ball. Yummmm. 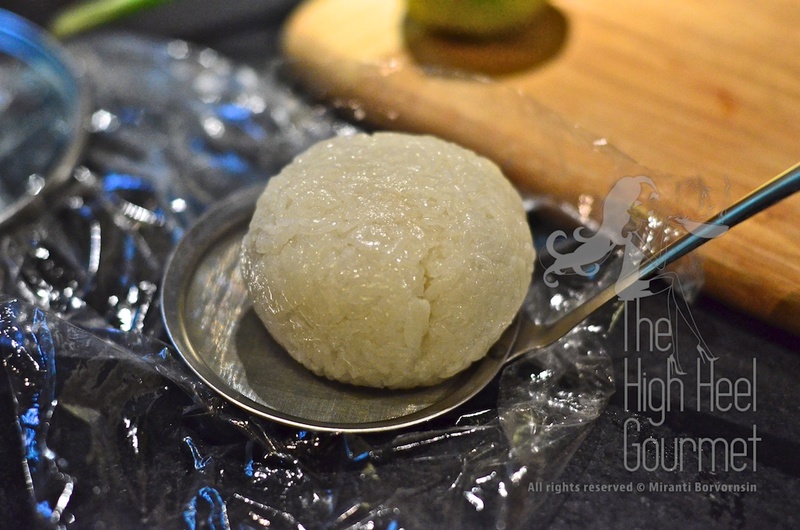 1) If your sticky rice is a little to dry, add a little water to it, then put it in a bowl covered with a plate and microwave on high for a minute or two until the rice becomes soft. 2) If your larb has too much liquid, drain the liquid into a pan over high heat and reduce it down. 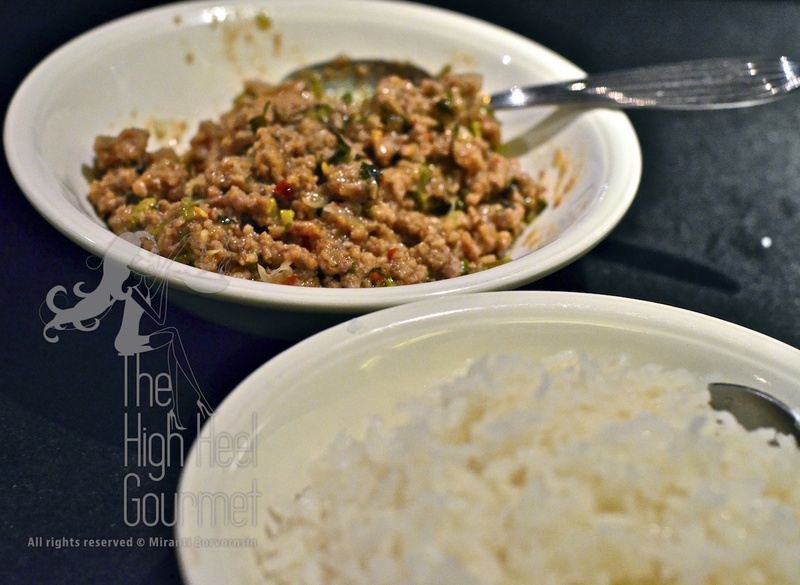 When the liquid is almost gone, add the larb back to the pan and saute it to mix the reduced juice with the meat. 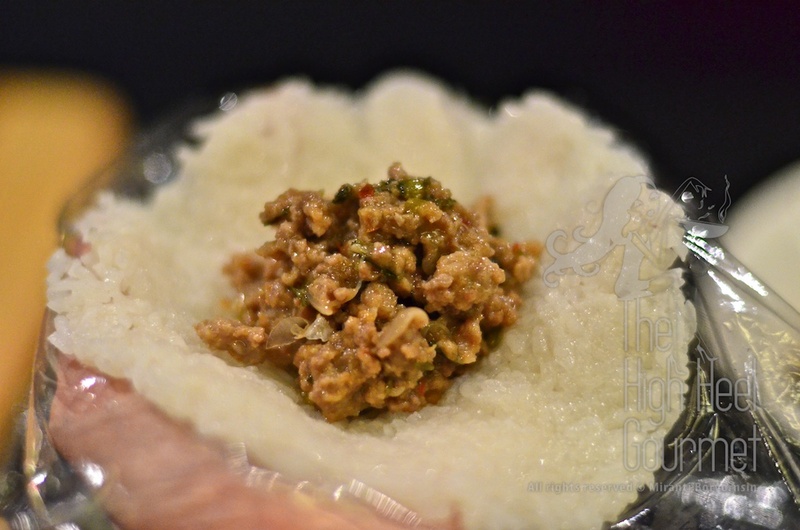 Place the larb into a bowl. 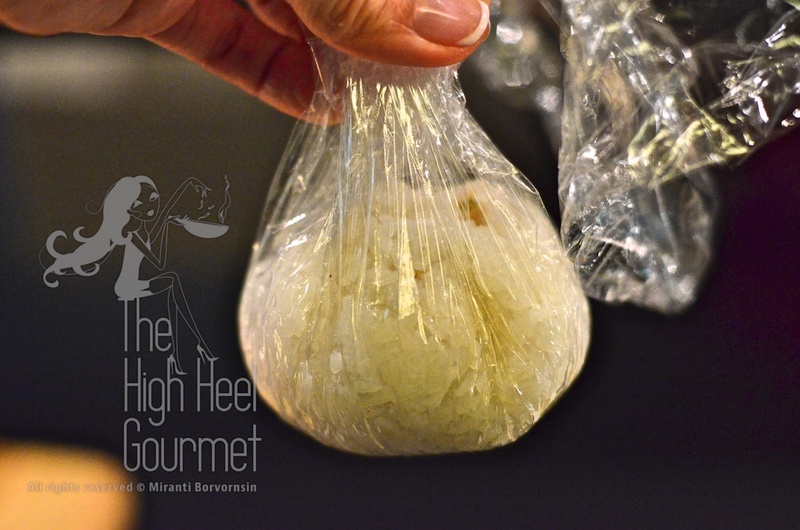 and pull all the corners of the plastic wrap together so the rice wraps completely around larb. Then press the top to seal the rice and make a nice round ball. You will repeat the whole shaping process with each ball. 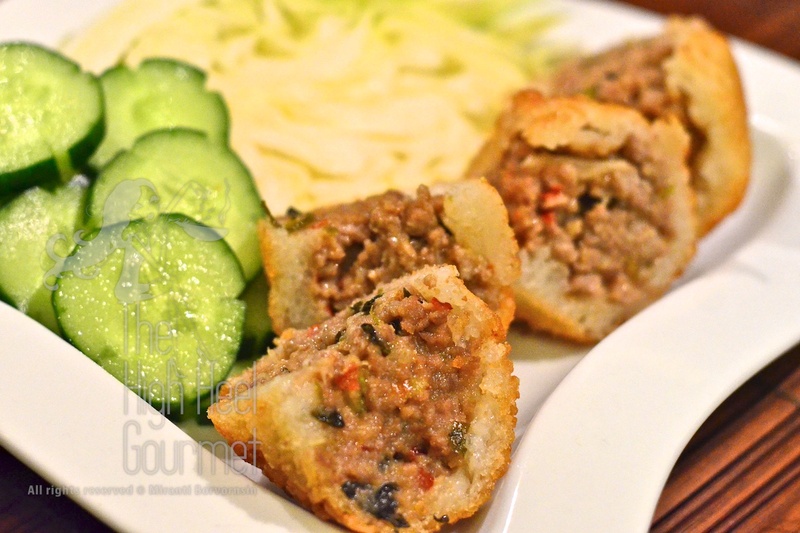 Make sure that the rice wrap around the larb tightly and there is no hole in the ball or you will be so sorry in the next step. 3) Put the vegetable oil in a pot. The deeper the pot the better, with room for at least one ball. I use my saucepan filled about halfway with oil. Set the pot over medium high heat and wait until the temperature reaches 375-400 F. I didn’t measure the temperature but watched for the oil to smoke lightly. If you use different vegetable oil, be aware that the smoking temperature of each vegetable oil is different. close the lid (so you don’t get splattered with hot popping oil) and wait a few minutes. You will start to see the rice turning golden color when you peek under the lid. Flip the rice ball if you need to (in case the oil doesn’t cover the whole ball), then cook until the whole ball is golden. Take it out and let it sit on paper towel. Repeat with each ball, of course. 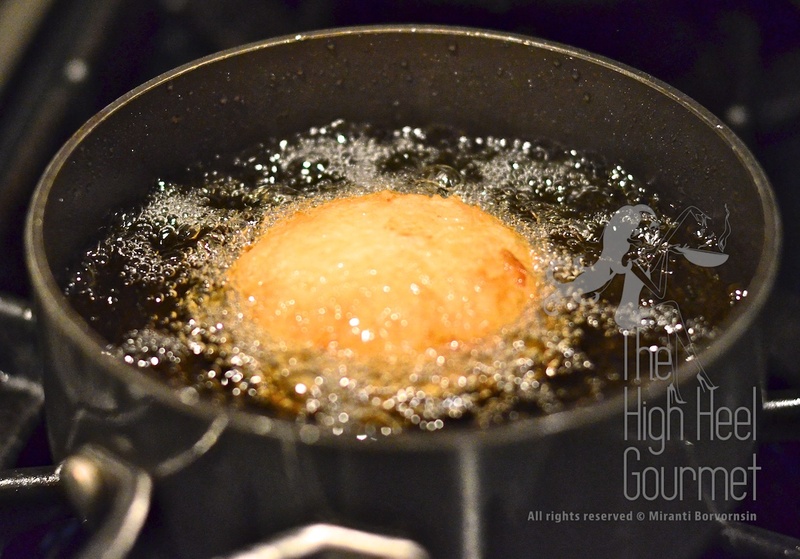 Be aware that the deep-frying step can be very messy and sometimes dangerous. If you have a deep-fry unit, use it. I have one that the highest temperature will only reach 350 degrees, so I use a pot over the stove instead. 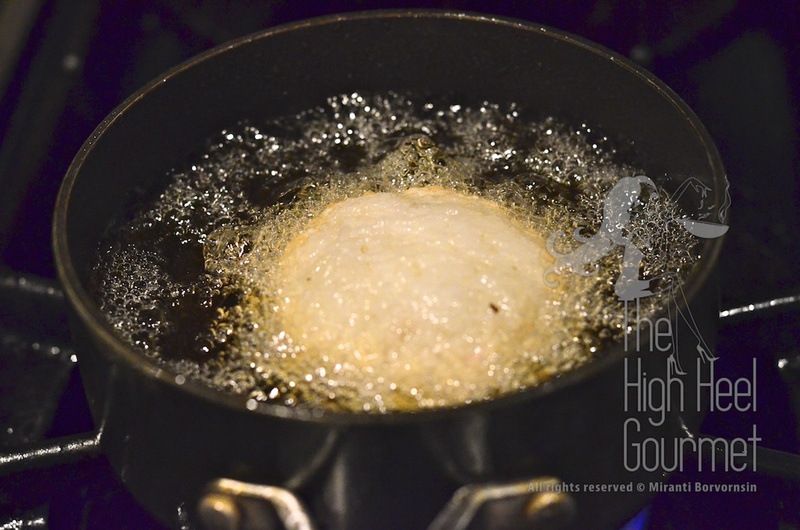 You could fry at 350 degrees too, but the result will be a little different. The rice might be crisp all the way to the larb, but it will save you from the cleaning problem and the burning the house down problem as well. Also,if you didn’t wrap the rice tightly enough, the liquid from larb will seep out and make the oil splatter. You don’t want that either. 5) Serve with fresh vegetables. Enjoy! 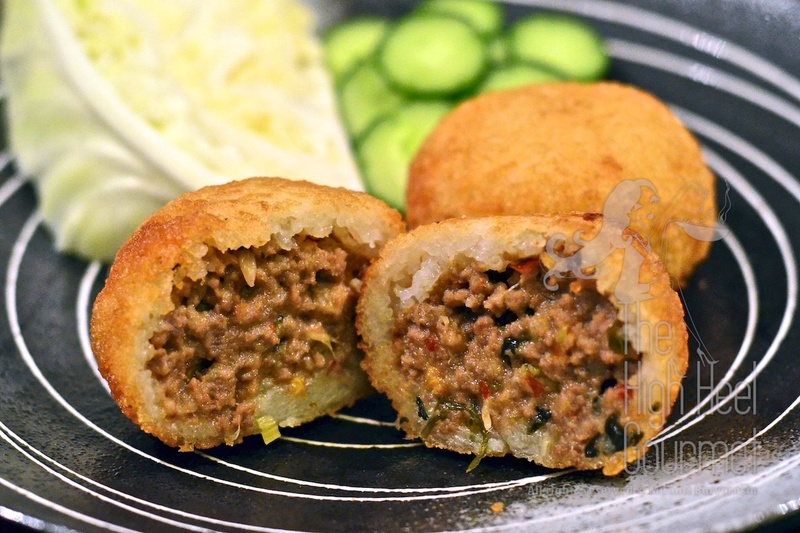 This entry was posted in Beef Bison Buffalo, Clicking in the Kitchen, Deep fried, Lunch, Pork, Small bites, Thai and tagged deep fried, Food, Larb, Recipe, sticky rice, Thai food. Bookmark the permalink. “Plastic wrap (not for eating)”. Haha, that made me laugh! lol…Jenny I listed it under “ingredients” section and you never know when those “Naivety” would laid eyes on my recipes, you know…BTW LOVE your blog and all those beautiful photos.